Today, I will travel back home from Akademy 2015. The first day the KDE e.V. general assembly did take place, then two days of actually interesting talks (including the great announcement of Plasma Mobile). After some more days with interesting BoFs and hacking, Akademy is now ending for me. I didn’t do that much work on Kate, I mostly did small bugfixes for the applications bundled with the KDE Applications releases regarding their HiDPI support, finally no Konsole that can’t redraw correctly on scrolling on a HiDPI screen with scaling activated! A big thanks to all organizers & helpers of Akademy 2015! You did a great job, it was a lot of fun, the location was nice, the social event + day trip was good, all fine :) One of the nicer Akademy experiences! Lets hope that the flight home works out, as Dominik is taking the same plane, otherwise the Kate workforce will be seriously diminished. PS: The official way to give KDE the rights to change licenses would be by signing the KDE e.V.’s FLA. Please note, that the KDE e.V. will not abuse this by immediately changing licenses you chose. Instead, this mostly about emergency cases (think of someone who suddenly passes away). But the script mentioned above is already a good start, since we can use it to quickly scan our code and identify problematic parts. It is important to note, thought, that signing the FLA also includes that the KDE e.V. gives you back all your rights, so for you and your contributions, nothing changes. There is a BOF session about all this on Monday, so make sure you attend if you’re interested! A common problem for many applications contained in the KDE Applications releases are non-incremented version numbers. Often the maintainer forgets to update the version number of the application, like I did it for Kate since the first KF5 based release. This means: On Bugzilla, I get bugreports that always tell me “Kate 5.0.0”, not very helpful. KDE Frameworks solves this by automatic setting of the current framework release version in all framework CMakeLists.txt. These variables will then be patched by the release scripts to the “right” version for the current release series. The yearly KDE conference Akademy is currently being held with lots of interesting talks and workshops. 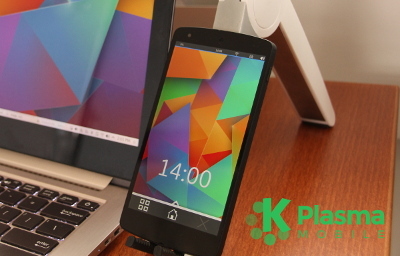 One big thing that was announced yesterday is Plasma Mobile, a free mobile platform. The presentation of Plasma Mobile was quite impressive: A video of using Plasma Mobile on a Nexus 5 showed a nice visual design, smooth transitions and quite some usable functionality already. This impression was confirmed later when I was playing around with Plasma Mobile on the Nexus 5 myself. So good job, plasma team! What’s important to note is that the project is still in a very early stage of development, and its target is to be really usable around mid of 2016. As such, there are most certainly stability issues and lots of features missing.